I prefer to play things in order, so when Bioshock Infinite was released I decided to go ahead and finally play through the first two games in the series. The first Bioshock started off rather gritty and the dark atmosphere coupled with strange noises gave me pause: I feared this was going to be a survival horror game, a genre I am quite bad at playing. I think I managed maybe an half hour to an hour on Silent Hill. However, aside from a few scares in the beginning, it really isn’t all that bad once you become familiar with the setting. Helping matters greatly is that death isn’t that much of a setback at all: when your health is depleted you are sent to the nearest Vita Chamber with your meters returned to half strength. The enemies you were fighting are not healed at all so, after awhile you no longer fear being beaten by a baddie. I am also not an aficionado of FPS games. I played Wolfenstien as a child but between that and Borderlands any other FPS games have been lost from memory. Having said that, even I can tell the controls for Bioshock are not that great. Switching between weapons and plasmids is annoying and can be down right tedious if you’re on a console and the plasmid/weapon you want keeps getting scrolled over. Sometimes it was easier to just ignore the radio dial all together and just cycle through them manually. The maps were a joke, with arrows and lines acting as inadequate signs of passage between stairways and alternate floors. Everything just ends up criss-crossing each other and you just sort of ignore the map and figure it out yourself. One of the major components of gameplay and story are the Little Sisters. You can save them or you can harvest them for ADAM, the fuel for player upgrades. Saving them grants you ADAM as well just in a lesser quantity. I’d wager most players save the girls; the moral choice just doesn’t lend itself as nicely to being a hard decision as much as the developers probably had hoped. The story more than makes up for all the faults, I feel. Andrew Ryan was a good bad guy unless you are a fan of the Ayn Rand way of thinking then he wasn’t a bad guy at all. Atlas was interesting although I never trusted him. In truth, it’s hard to trust anyone you only ever meet over a radio. 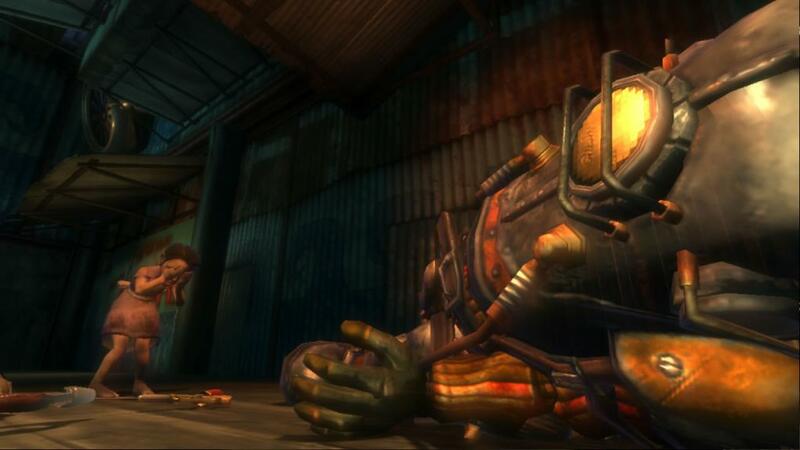 And unlike Bioshock Infinite, the boss fight for the first Bioshock doesn’t make you want to throw rocks at babies. Once you get the pattern down it isn’t too bad, at least not on normal/medium difficulty. The ending is also pretty darn good. I wouldn’t be against playing it again, but considering how long it took me to just play it the first time around, chances are I’ll probably won’t get around to a second turn. Then again I’ve played Mass Effect numerous times, so you never know.